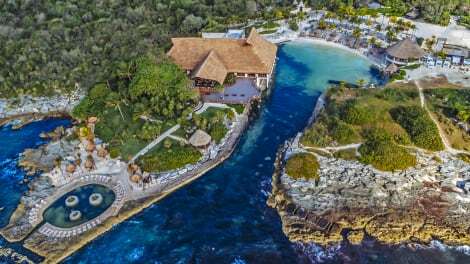 Tucked within an ecological and historical preserve, the Riviera Maya All-Inclusive resort Occidental at Xcaret Destination captivates guests with spectacular grounds, a pristine coastline and unparalleled service and amenities. This Riviera Maya resort is located adjacent to the spectacular, breathtaking natural wonder of the eco-archeological Xcaret Park in the heart of Riviera Maya, 45 minutes from Cancún and 10 minutes from Playa del Carmen, this glorious resort boasts winding river channels, free-form pools and variety of gastronomic options. At the Xcaret Park, travelers with a taste for eco-touring and adventure can explore the remains of a Mayan village, snorkel through ancient caves and underwater gardens, swim with dolphins, or observe jaguars, butterflies, tropical birds and other indigenous species in their natural habitat ($), all a short distance from the resort. The Occidental at Xcaret Destination also features 11 restaurants and 10 bars including a discotheque, to fit every mood and occasion. lastminute.com has a fantastic range of hotels in Xcaret, with everything from cheap hotels to luxurious five star accommodation available. We like to live up to our last minute name so remember you can book any one of our excellent Xcaret hotels up until midnight and stay the same night.